Figure 1. A. The 4-lane accelerating rotarod; B. Each lane is equipped with a built-in automatic timer; C. The speed of the rotating rod is adjusted manually. • Grip-strength transducer: Chatillon-Ametek digital Force Gauge model DFIS 2 (Columbus Instruments, Columbus, OH). Figure 2. A. The Chatillon-Ametek Digital Force Gauge, DFIS 2, system; B. The triangular metal transducer (8 x 8 x 8 cm; ~0.0625" gauge wire) is situated 25 cm above an insulated platform; C. The Force Gauge digital display. The exploratory hole-board consists of a piece of opaque Plexiglas, 24-inch x 24-inch in total area, and positioned 12 inches above the floor. See Figure 3 below. • The board is separated into 4-inch perimeter (outlined in red) and 20-inch open arena (shaded). • The perimeter is further divided into six 4-inch boxes along each side to determine the total number of line crossings and locomotor activity of the mouse. • The open arena has 16, 1-inch holes, each containing infrared photobeam detectors. 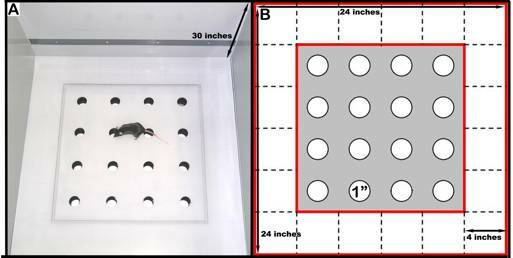 • A black, matte Plexiglas box (30-inch high) surrounds the hole-board and contains the mouse within the arena. • Cleaning supplies: paper towels, 70% alcohol. • Masking tape: for securing vertical wire-mesh and tail weights. Mice are allowed to acclimate to testing room over the weekend. The Economex Accelerating Rotarod is used to analyze motor coordination and balance. a. Mice are placed on a rod 3.5 cm in diameter, which is situated 40 cm above a foam platform. b. Four mice are tested simultaneously, with each mouse being separated from the next by a 30 cm wide x 60 cm high opaque Plexiglas wall. 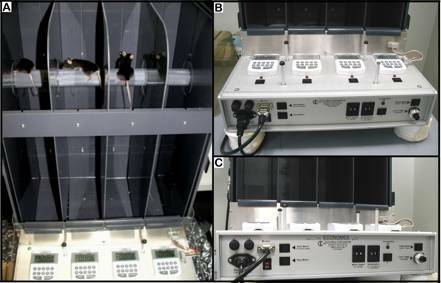 c. The mice are initially acclimated to the instrument by being placed on the stationary rod for three consecutive trials with a 1 min limit. d. Each mouse is then replaced onto the rod at a constant speed of 4 rpm for three consecutive trials- each trial is limited to 1 min. e. Finally, to measure balance performance, the mice are re-positioned on the rod, starting at a constant speed of 4 rpm, with an acceleration of 1 rpm/s over a 1 min period, and ending at about 64 rpm for three successive trials. f. Latency to fall is recorded for each trial. 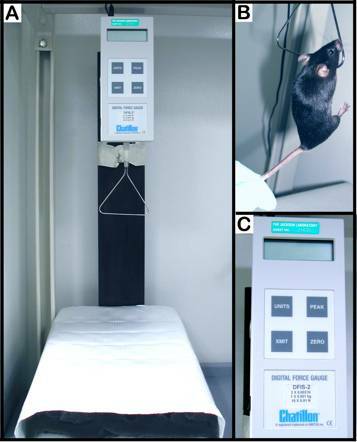 The Chatillon-Ametek Digital Force Gauge, DFIS 2 is used to determine the strength exerted by the forelimbs of a mouse in response to a constant downward force of 1.1N. a. The grip-strength meter is positioned vertically, with the triangular metal transducer situated 25 cm above a foam platform. b. A 4-oz/113.4 g weight is attached to the base of the tail with masking tape, which allows for the consistent application of a known downward force. c. The mouse is then raised toward the triangular transducer and it instinctively grasps for the bar. d. Care is taken to ensure the mouse is holding the grip transducer properly, with and only with both front paws. e. Once an appropriate grip is assumed, the mouse and the weight are released simultaneously and peak force is measured in kg. f. Three consecutive trials are performed and a mean peak tension over 3 trials is calculated for each animal. g. A maximum peak tension over 3 trials is also calculated. The exploratory hole-board and open field is used to assess anxiety, exploratory, risk assessment, locomotor activity, and arousal behaviors. a. Each mouse is placed in the center of the open arena for observation and evaluation. b. While in the arena the behavior and performance of the mouse are recorded over a 5 min test session. c. A Sony digital video camera is used to capture all events, and allows for further analysis by an unbiased observer. d. When a mouse dunks its head into any of the holes, a beam break is recorded. Grip strength: Overall grip strength for 3 trials.